Carissa Gervasi wants to help Florida’s recreational fishing industry. Anglers love to catch crevalle jack because they are big, move fast and put up a great fight. Guides rely on them as a backup if they can’t find other gamefish, including bonefish and tarpon. But, anglers and guides alike have noticed a dramatic decline in their catches. Gervasi, an FIU environmental studies student, is studying how effectively marine reserves protect and restore populations of crevalle jack, an economically important catch-and-release fish. She is zeroing in on reserves throughout Florida Bay and the impacts of no fishing and restricted fishing on their abundance, size and behavior. Her research can inform management plans for the unregulated species. Fishing influences fish behavior, including where and when they move. Gervasi is implanting small acoustic tags into the fish to track their movements. She is relying on citizen scientists – many local anglers – to capture and tag the gamefish, and to share their fishing experiences with her through surveys. An extensive network of underwater acoustic receivers throughout the Florida Everglades note the fish, date and time when they swim within range of one. Gervasi is also examining crevalle jack ear bones that retain the chemistry of the bodies of water where they live. 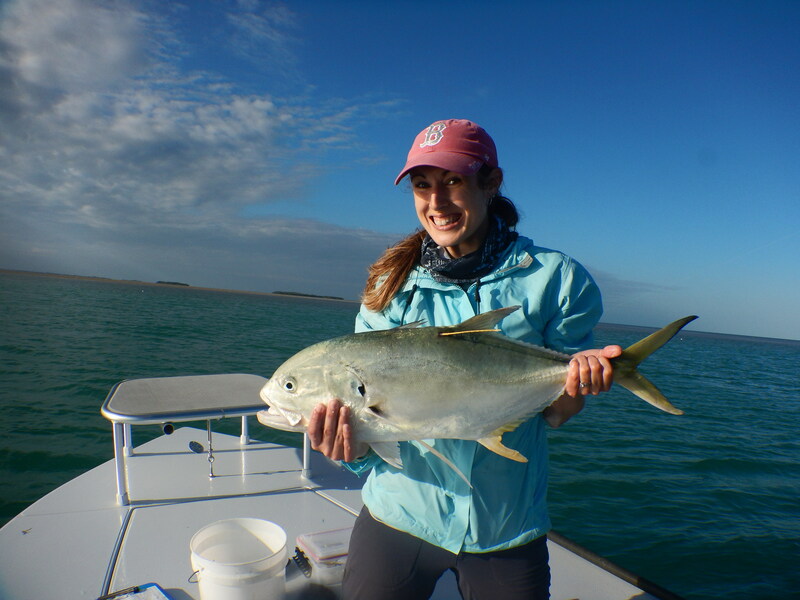 “If a management plan is going to be created for crevalle jacks, knowing their movement and migration patterns is vital so that the scale of management can match the scale of movement,” said Gervasi, a Ph.D. student in the Department of Earth and Environment. Crevalle jack and other saltwater gamefish in the Everglades bring in more than $883 million in annual revenue to the state. Jack fish, as they are known colloquially, also play an important role in the environment. An apex predator, they help maintain balance in the food web. “Ensuring their survival is critical to restoring a functional ecosystem that will thrive into the future,” Gervasi said. Gervasi is conducting the research under the guidance of Jennifer Rehage, coastal ecologist in FIU’s Institute of Water and Environment. It is funded in part by the Everglades Foundation’s FIU ForEverglades Scholarship.